My rocking chair will not be getting my beautiful aqua/turquoise vintage fabric. Unfortunately, the upholsterer thinks it's too thin and will not wear well on the chair over time. On the one hand, I'm glad that he let me know so I the chair doesn't end up worn out in a couple of years. On the other hand, I really loved that fabric!! 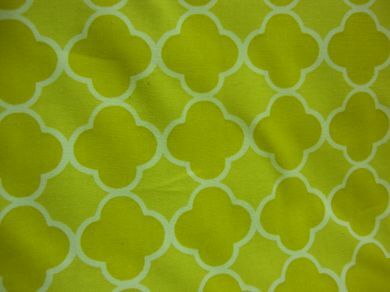 On the upside, I *think* I have enough of the fabric to use it for curtains. I think it would be great for that. I already bought some sheers from Target that have a Moroccan-ish diamond pattern on them, and I think the two textures would look pretty together. Since I'm in the midst of a storm of end of semester papers and don't have time to drive the 45 minutes to the fabric store my upholsterer recommends, my mom is going to go for me tomorrow. I trust her, and the beauty of a camera phone is that she can send me some of the contenders. My mom and I send each other thrift store (or other) finds via picture text all the time. These days, she's able to do more shopping than me, so it's a little one-sided, but I really really appreciate it. She's found so many great pieces for the baby's new room. Some day I'll have time to do more thrifting, but in the mean time, she's been a champ. Most recently, she found a Dwell crib skirt for a few dollars. It's from a different line than the brown and white, but it will work fine. So, if you want to weigh in and read this before tomorrow, feel free to chime in with some fabric suggestions! I'm wondering about doing a brown velvet or brown boucle, but I don't want the chair to end up looking "old lady." The fabric store is called Fabrics and Fringe, and the online selection is a little sparse, but there are a few samples I like. Oh, and we are buying from here because they offer a discount via our upholsterer, and because he can pick it up from them easily. If I bought online, I'd have to get it shipped to me, then shipped to him. No thanks. Also, this way my mom can see the samples (and feel the samples!) in person. Definitely an advantage. I know a lot of online shops allow you to get cheap samples, but then that's just even more time to factor in. Double no thanks. 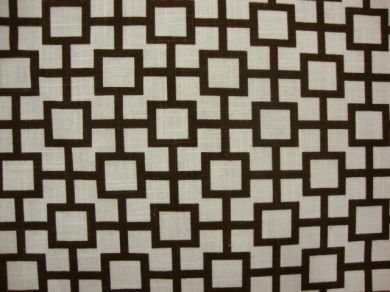 Here are some pattern samples I'm digging from the website. I love the first and third ones. They're definitely NOT old lady patterns! Oh wow, I love them all but I'm really loving 1, 3 & 5. Good luck! Awwwwwwwww...dag gone it. I'm sorry to hear you can't use your gorgeous fabric on your chair but hopefully can use it elsewhere. I like all of the above fabrics and not sure which I would pick. P.S. Blackberry phones are the most annoying phones EVER. FYI.